Pros: Milo McIver is probably one of the most beautiful locations I've ever played disc golf at, or even heard of having disc golf. That being said, Milo doesn't have the "all inclusive" features that I believe make it a 5 star, perfect disc golf experience. -Tees are great, solid concrete, big enough to work well. There are two sets of tees for every hole on the east 18. These alt tees, unlike some courses are actual unique holes, not necessarily smaller versions of one hole. -Tee signs are helpful. There is a 27 hole layout that incorporates the 18 hole east course with the 9 hole west course, this is a little confusing if you aren't a local, but the signs are on every hole and every pad. -Baskets are often somewhat difficult to locate because of the sheltered nature of most basket placements or the big distance on a lot of holes, however, tee maps give you an idea, and bright red bands stand out against all the green. -This course has truly amazing fairways, I have never played a course like this one, that has the open grassy fairways (that do have the occasional massive tree) which are lined by thick forest. However, there are holes that weave in and out of the woods, so it isn't simple open golf the whole time. This signifies excellent design and land use. -The rough is pretty much perfect here, there is what I would call positional rough, meaning you are out of position, but still have good footing, and then there is the "rough rough" where you are in the trees and have to pitch out or something. -Milo McIver has a wide mix of long flat meadowy type areas and massive rolling hills, the course uses those land features exceptionally, as many holes use either one as a key feature. -If i were asked to define the "wow factor" of disc golf, I would point right here at Milo McIver State Park, the setting is simply so majestic and grandiose, that it is humbling to think that there is a disc golf course, that you get to play, just right there. I mean, I literally walked up the the first tee and said "woah"
-This course challenges every player, it gives you oppurtunities to throw everything you've got, I'm the type of guy who carries tons of discs around, and I threw every single one more than once out here. -You can get super creative out here, some holes are tight and force you to do what they want, others you can do virtually anything and still have a shot at par. -The grass in the fairway is pretty long, not that I think that it could or should be mowed, because there is an insane amount of land, but I played in the rain, and the long grass with ran on it soaked me to the bone. Other Thoughts: One of the top courses there is. Go out and play it. Just wish it had both 18s up year round then it would be 5 Star no question asked. Pros: Phenominal is a good way to put this course. Just so ideal and its like the property was made for disc golf. DG Heaven + a River nearby to listen to during the round and get in afterward. - Nice Mix of Forehand/Backhand and nice mix of Wooded/Open. Bring all your skills to this course. - Quiet except for the river and chains/cheers. -Pro boxes are hard. Im not Simon. Am boxes still provide a good challenge on a hot day. -Fun shots to be had all over this course. Many memorable holes. -Scenic. When you take your camera out at every hole, you know you are somewhere special. Cons: -Just the baskets, really. I think it would be awesome if Innova or Someone ran some fundraiser discs just for these amazing courses to have the best baskets. Id gladly pay 20 bucks for a dela or milo stamped disc. These rusted out red 24's are a disservice to the quality of this layout and history behind this course. Other Thoughts: 27 holes totally currently. East 18 made sense but finding next hole and Layout (Both 18 and 9 hole course) was semi confusing..especially the starting point on the 9 hole. Didn't help the group in front of us made a cut over to the other course at some point for their version of 27 holes. Signage was good at the TeeBox's but not on the map online. The map only shows 1 parking lot but you have to go all the way down past 2 additional lots to get to the West course (9 hole) parking area. You will see baskets (most likely holes 4-9 of the west course) and then you will know you are there. Farther down is the drop in for the river. 1) Difficult course with wide variety of shots across 27 holes with Pro and Amateur tees. You will want to come back again and again. Was very glad that we made the trek up to the Portland area to play. 2) Many risk/reward shots. Baskets were set-up with wood chips underneath so very inviting to take the aggressive line. 3) Played right after the Beaver State Fling so the course was absolutely perfect. 4) Large concrete tees and great signage on the East course. 5) Lots of close parking. 6) Maps available at the entrance and also online. 7) Lots of other great courses within 45 minutes. The Portland area is truly a Disc Golf destination. Cons: 1) Signage on the West 9 is non-existent. Hopefully that was a function of the Beaver State Fling and will be remedied. Map helped. 2) Some water fountains don't work. 3) Being in a beautiful State Park you get lots of other traffic so be careful of people not paying attention. 5) Even though it is a little of the beaten path it is very popular so play early. Other Thoughts: Great course for 950+ players, good course for 850+ players. Would think that beginners would be a little frustrated with the "bigness" of Milo. But if you can throw 250+ and don't mind being over par it is a definite bucket list course. Glad we made the trip! - beautiful scenery with the clackamas river floating throughout. Cons: -Some of rough can be a little thick and full of thorns if you find your way, but the fairways are more than fair to stay out of trouble. - course map in kiosk could have been a little bit more informative about how the 18 hole + 9 hole layout flowed together. Didn't realize you needed to jump off the 18 hole path to play the other 9 in the middle, so we played the "back 9" afterwards, which you just drive to the other parking lot to start on. Other Thoughts: This course is in my top 5 list of courses easily to go along with Maple Hill, Nockamixon, Moraine, and Deer lakes. My wife and I had a blast playing this course, and then afterwards we hopped in our swimsuits and jumped in the river and swam around for a bit. Wish we had tubes to float down the river! Pros: Long, stunningly scenic fairways on 27 beautifully carved holes, right on the Clackamas River. Very challenging with stroke bleeding rough. Nice mix of woods and open holes with lots of shot options. Concrete teepads, nice baskets. Benches on most holes. Lots of clean bathrooms. Plenty of parking. Cons: The only two cons I really have with Milo is that they don't put the Beaver State Fling layout in more often and dual pin placements would be nice, as they are typically required for my rating of 5. I don't have a problem with either here as it is always a pleaser. 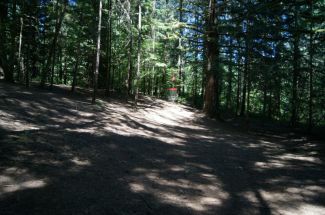 Other Thoughts: Not too much can be written, that hasn't already been said about Riverbend DGC at Milo McIver State Park. It is one of my all-time top 3 favorite courses and just an absolute gem. I was fortunate enough to play the 36 hole tournament layout after 2014 Worlds and equally as fortunate to play in the 2017 BSF. This course, as the 36 hole tournament layout is one of best and most beautiful courses in the world. Pros: this place has huge beautiful fir trees with a 27 hole championship level layout ,like hole 2 is 1200+ feet and all of it is just amazing ,hole by the river with elevated tee is one of the best and can put the water in play if you miss your line. Oh, and by the way, there's a disc golf course! The signage at each tee is the best. There is excellent signage at both the pro and amateur tees. Cons: The drive is long to get there but worth it. The hazards are serious, like if you lose a disc in the big, rushing river then history. Other Thoughts: If you're in the area you should visit this classic! Pros: This was the 170th course that I've played, and certainly in the top two or three in terms of beauty. Playing through the giant trees and across the lush grass, with the Clackamas River rushing alongside the course makes for a really pleasant day of golf. Holes lengths vary wildly from 175' out to the 1185' Hole 2 (west) from the pro tee. Overall there are a lot of long, open holes on the course. The fairways are surprisingly wide and forgiving, and the course favors those with big arms. I was surprised at how few truly wooded holes were here, given the amazing forest surrounding the course. Holes 2 & 3 on the west course are the real stand-out wooded holes and I enjoyed them. Most of the other holes were fairly open. Great textured concrete teepads on all holes, with most offering an "am" and a "pro" tee. The pro pads really stretch the course out. There were very nice tee signsat all 36 pads on the East 18. Baskets were showing some wear and tear, but caught fine. Most of the baskets had a flag on top with the hole number, and that was a help for first timers like myself. Two giant parking lots make it easy to access either course. Cons: While I thoroughly enjoyed the course, I hoped that there might be a little "more". More elevation, more water in play, or more heavily wooded holes. Signage on the West 9 was non-existent. Navigation was a little tricky, but with the map and "next tee" arrows you can make your way around. Other Thoughts: A standout course in a beautiful location. A bit out of the way but worth the trip. I played this course after many days of heavy rain, and it remains completely playable with very little mud or standing water. Pros: - Riverbend is awesome course. And is my favorite course. The course gets really well maintained. - Easy to find the next hole. - Steps down from elevated tee pads. - Very quiet because it is a huge piece of land. This course has a great picture perfect view of the Clackams River with holes right by it. The Course has amazing bathrooms. This course it one of the prettiest courses I've played. There are now really nice teepad signs so that is an improvement. - The course is in prime shape. And you will have no trouble finding your way around the course. Cons: - This is not the best for beginners. Some of the chains are rusting. Long grass is hard to find your disc. Other Thoughts: Milo is my favorite course to play. Known for the Beaver State Fling this course offers stunning views and and a crystal clear Clackamas River. You should come to the Beaver State Fling if you haven't been here. It is cool to see the pros play.